For 2014, Audi's A7 "5-door coupe" finally offers Americans a taste of what their European counterparts have been offered for years: choice. Be it the basic 3.0T luxury trim, the high-mileage TDI diesel or the high performance S7 and RS 7, Audi's sleek A7 lineup has something for everyone with the means to afford something for everyone. 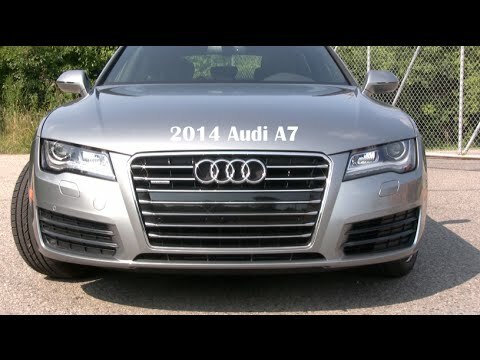 The good and the bad of the a7. Audi a7 features a posh interior, a generous number of standard features, lots of cargo space, and powerful engines. However, exceptionally high total ownership costs push this Audi toward the back of our competitive luxury large car rankings. Pros/cons. Potent engine lineup. Upscale interior with lots of standard features. Great cargo capacity. Sloping roofline cuts into rear-seat headroom. High projected ownership costs. It is like a fast horse frolicking in the wind. It works good as a daily driver, only has a slight squeak. It works very good to go from point A to point B and it is really good for taking quick and sharp turns. It is not the best for a huge family as it only fits 4 people comfortably and it slows down if you have 5 people in the car. Other then the slight squeak the car is the best. Timelessly gorgeous, refined performance, roomy hatchback cargo area. A fastback roofline gives the A7 both flair and hatchback practicality, while the luxury cabin pampers occupants. All-wheel drive puts the torque of the 340-hp supercharged 3.0-liter V-6 to the ground through an eight-speed automatic. A taut suspension and sure brakes round out the A7's performance cred. Volkswagen will notify owners, and dealers will install a PODS system repair kit, free of charge. Interim notices informing owners of the safety risk were mailed July 31, 2018. Owners will be sent a second notice when the remedy becomes available. Owners may contact Audi customer service at 1-800-253-2834. Volkswagen's number for this recall is 74D5. Audi will notify owners, and dealers will replace the fuel line, free of charge. The recall began February 5, 2018. Owners may contact Audi customer service at 1-888-237-2834. Volkswagen's number for this recall is 20AR.